Natural mascara is a wonderful alternative to many of the brands you purchase at the drug store. These mascaras are just as effective, they’re affordable, and they help open up your eyes and show off your style. To help you find the best natural mascara, we researched a variety of new and bestselling products. The result is the top ten natural mascara review list below. Now: Before we get started, here’s what you need to know when shopping. Waterproof: There is a misconception that natural makeup will not hold as well or will run with a little moisture. We’re here to prove that old wives tale wrong! Many of our top ten are waterproof and will last all day. Colors: We take the time to let you know not only about the quality and beauty of these natural mascaras but also about the colors. Black, brown, and perhaps some surprises along the way. Each is clearly marked for you. 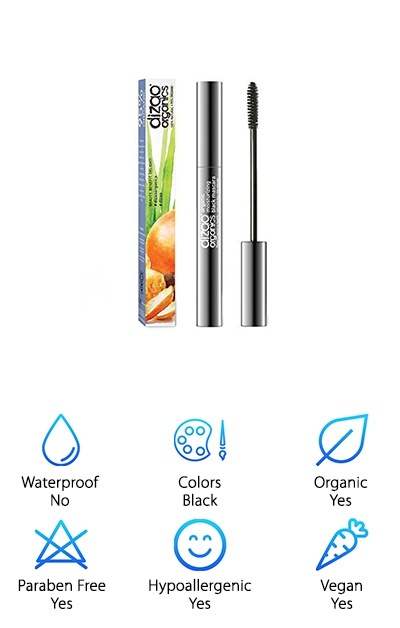 Organic: You will be able to find a 100% natural mascara that is also organic. Organic mascara is a delightful option for makeup experts and beginners, too. No matter how familiar you are with organic makeup products, you’ll love our picks. Paraben-Free: Many of our natural mascara brands are paraben-free. Parabens are preservatives used widely in the cosmetics world. Customers like having the paraben-free option, so we took the time to find some for you! Just check the chart for more information. Hypoallergenic: Many people seek out natural mascaras due to allergy, irritation risk or sensitivity to normal drugstore brands. That’s why we made sure to find great mascaras with hypoallergenic qualities, so they will not trigger allergies and can be worn safely. Vegan: There are some great vegan mascaras out there. The vegan label means that zero animal products or byproducts are used in the manufacturing process for these items. We selected some wonderful vegan beauty enhancers, and you will be thrilled discovering them. 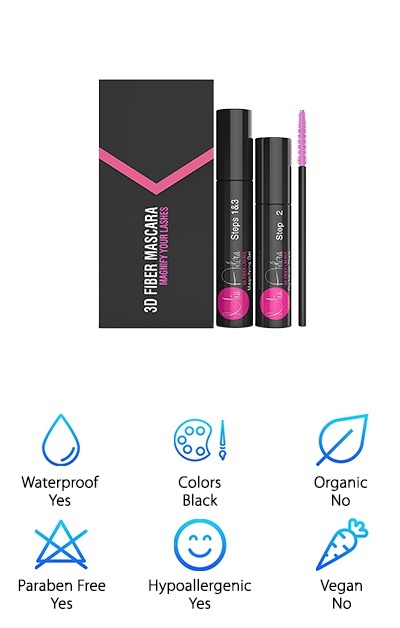 Now that you know how to choose a great natural mascara, let’s get right to the reviews. Here’s the deal: If you’re in a hurry, check out our top pick and our budget pick first. Both are fantastic products, and they are among the very best natural mascaras we found. Right below, you’ll find all runner-ups in our natural mascara reviews. If you’re looking for the best natural mascara available, chances are, it’s on this list. Let’s get started! With a wink, you can transform your beauty routine. Our top pick is the Mia Adora 3D Fiber Lash Mascara. This is so much more than just a mascara, and that's why it is a cult favorite amongst makeup enthusiasts. Here's what you receive: 1 tube of wet magnifying mascara gel, 1 tube of dry microfibers, a carrying case and a free ebook! The application is simple: Prep your eyelashes with a single coat of the magnifying mascara gel. It will help lengthen them and get them ready for fiber placement. The fibers are all natural, made from green tea. They will coat your lashes, sticking to the gel without clumping or becoming spidery. Give them about 30 seconds to set, and then use one more coat of gel to seal. You’re all done! You will look like you had professional eyelash extensions applied, for the price of a deluxe mascara set. That is a steal – and you’re going to look great. If you want to start using beauty products with ingredients that are not harmful, it makes sense that you want to get started right next to your eyes! It is a highly sensitive, easily irritated area. Our eyes need to be protected and pampered. We all have stories about the time we tried that one brand and couldn’t stand the smell, or the ingredients. Our reviewers think you will be really happy with Naturally Rooted Organic Mascara. Check this out: It is loaded with organic ingredients. You get a mascara with added chamomile, which conditions, and sunflower oil, which strengthens and has plenty of antioxidants. 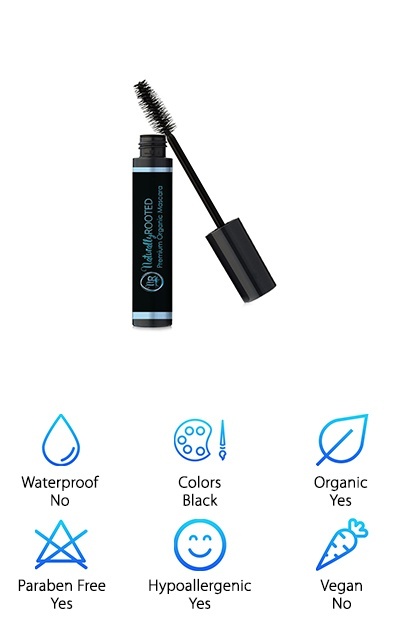 Even though your lashes are getting softer as you use Naturally Rooted, the mascara will still stay in place because this formula is water resistant. This is a deep, dark black that can be coated on in multiple layers for different effects. It is also free of parabens and it is hypoallergenic too! Burt's Bees is a popular brand because the people behind it are dedicated to finding natural solutions for everyday problems. That's why they came up with Burt's Bees Natural Mascara. It is an economical, healthy choice for people who use contact lenses, people with sensitive eyes, and people who just aren't happy with what's available at the corner store. Want to know the best part? This natural mascara doesn't just enhance your eyelashes, it helps them. It is formulated with Jojoba oil and glycerin, so those little hairs will be moisturized and strengthened as they are elongated. Select from classic black, or black-brown shades. 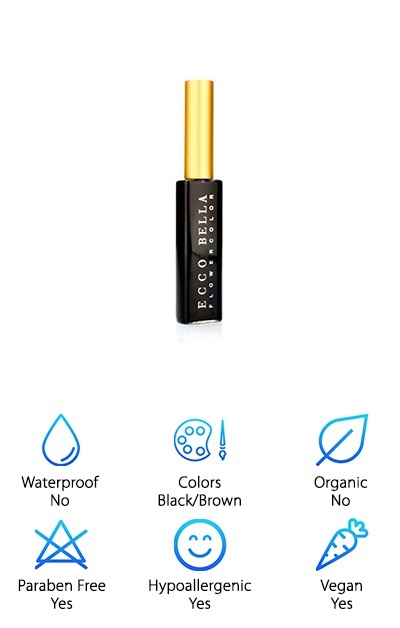 There are no parabens in this mascara, either. It is hypoallergenic for allergy sufferers. You don't have to go makeup-free now that you've found Burt's Bees! Our reviewers also loved that this mascara is cruelty-free. It's never tested on animals. You are going to love it! Were you born with perfect lashes? No? Then you should probably give natural mascara a try. And if you’re worried about making an affordable purchase, you have to check out Natural Organic by Endlessly Beautiful. It isn’t just going to give you a glamorous look. It’s also formulated to make your eyelashes healthier! What are we talking about? Check out some of the ingredients: Chamomile, vitamin E, coffee powder and sunflower seed oil. These natural ingredients combine to nourish, condition and help grow your lashes. You can choose this product in either black or brown. This is a vegan and cruelty-free product, too! No animal testing whatsoever. Smudges, clumps, and flakes will be a thing of the past. It will last all day long, and then come off easily. This mascara isn't just great for your wallet. It's a bargain for any makeup enthusiast. It is gentle and non-toxic, so even people with sensitive eyes be happy to try it on. Beauty enthusiasts know a lot about the wonders of coconut oil. Now there is a natural mascara infused with coconut oil, too! Noix de Coco Organic Mascara is both gentle and enriching. Made with organic ingredients, it will coat your lashes without clumping, while enhancing your lovely face. It is loaded with organic ingredients, including chamomile, carnauba wax, sunflower oil, lemon peel, rosemary, and lavender. Apply one layer for a day out running errands, or add a coat or two for a special evening with friends or loved ones. It's going to help even the most sensitive eyes sparkle since it isn't loaded with chemicals or preservatives like some drugstore brands. In fact, it is free from parabens. 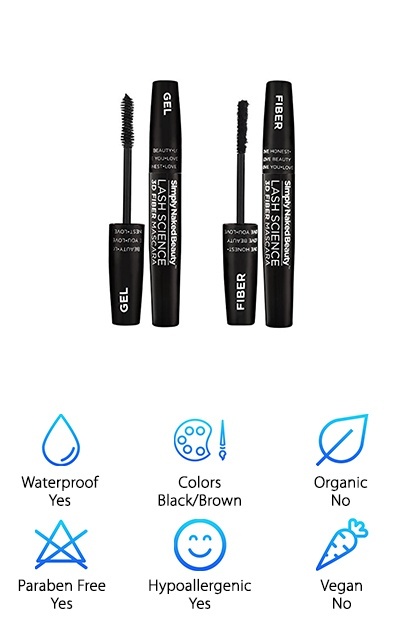 It is hypoallergenic, so people suffering from allergies should give this mascara a try. You can order it in black or brown for an even more natural look. It is free of dyes, toxins, and gluten too! Noix de Coco is cruelty-free. Are you looking for a natural mascara you can even wear comfortably at the gym? That's right: Simply Naked 3D Fiber was created as a natural solution that will stick with you despite sweat and tears. 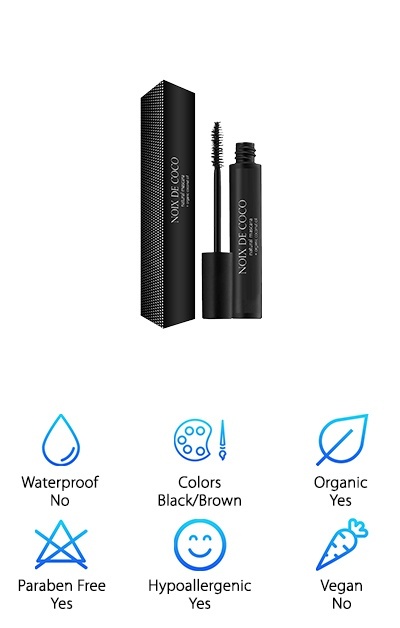 Here's how it works: Non-irritating and non-toxic ingredients are combined to give you lovely lashes in either the midnight black shade or dark brown. Natural green tea fibers are added to get those lashes looking longer and fuller. All of the ingredients are hypoallergenic, so if you've been bothered before by an allergic reaction to makeup, this is worth your time. It is also made without parabens. You get not one, but two mascaras in a nice carrying case, so the cost is comparable to virtually any grocery store or drugstore brand. There is no need for expensive, time-consuming false lashes or eyelash extensions. This will give you the look you want, every time. Get the 3D results and curl you're craving with Simply Naked. The right mascara can take you from frumpy to fancy, from day to night, or from casual to black tie. Get the accessory everyone is talking about, and try Stellar Gaze Length & Strength Mascara on for size. This mineral mascara is the addition you need for your makeup bag, both at home and on the go. It is loaded with vitamin B and coconut oil. Like all other Pacifica beauty products, it is 100% vegan and cruelty-free, never tested on animals. There is no gluten, and no phthalates, parabens or sulfates either. Here are some of the things that are included: Rice protein, brown kelp extract, and vegetable-derived glycerin for shine. It is hypoallergenic, so it’s a great choice for allergy sufferers. You can pick from classic black or brown shades. Wash it off easily with warm water, so you don’t tug unnecessarily on fragile eyelashes. It is extremely buildable, so adding a layer or two is easy. Some mascaras can go on smoothly, but turn crunchy and brittle with time. That's not the case with Dizao Organics Mascara. It is made to not only get your eyelashes to stand out but also to moisturize and care for them. This is crazy: This is an organic, vegan product. Its beauty shines from within, with added organic coffee powder for color, organic rice for stimulating lash growth, organic carnauba wax to condition and a chocolate aroma you will love! We're not kidding: This mascara is scented with chocolate. Volumize your lashes happily, knowing this mascara was never used in animal testing. There are also no parabens, and it is hypoallergenic. Even people with severe allergies may find refuge with this wonderful product. 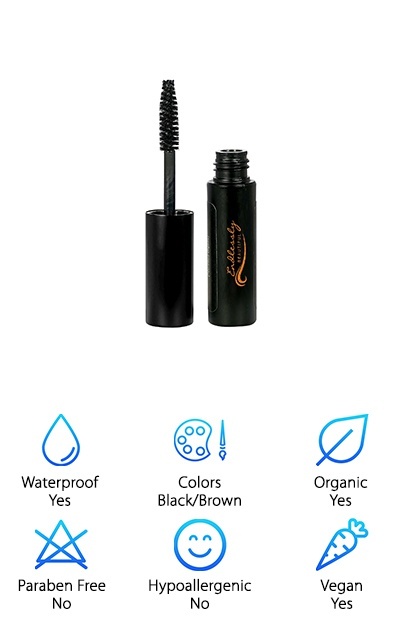 The mascara comes in traditional black, which suits everyone. There are no artificial colors, preservatives or fragrances. It is not more expensive than the popular drugstore brands, either. What are you waiting for? Try it out now! Your mascara can be the finishing touch on a fully made-up face. It can make the difference between a casual day out, or a glamorous special occasion. That’s why you need to choose wisely. 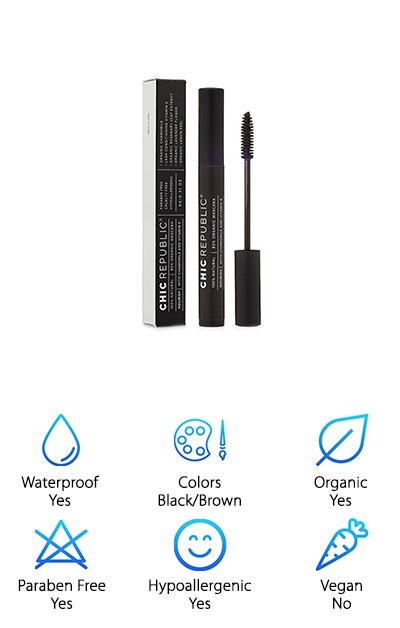 Consider Chic Republic Organic Mascara! Here’s the scoop: This mascara is made with all of the good stuff, and none of the bad stuff. It is 100% natural. Because the preservatives are naturally derived, this is paraben-free. There are also no synthetic solvents. Essential oils plus organic carnauba wax and beeswax will plump up your lashes and give them a boost. Even the color pigments are natural and free of any artificial fragrances. Not convinced yet? You can get Chic Republic mascara in either black or brown shades. It is hypoallergenic, so people who suffer allergies of any kind should give it a try. Organic sunflower oil loads this mascara down with powerful antioxidants. This mascara manufacturer created a highly sensitive and efficient beauty product. All-natural products are not just for environmental activists, they are for everyone. There are many great mascaras out there that are both good for planet Earth, and good for your eyelashes. This is one of them! 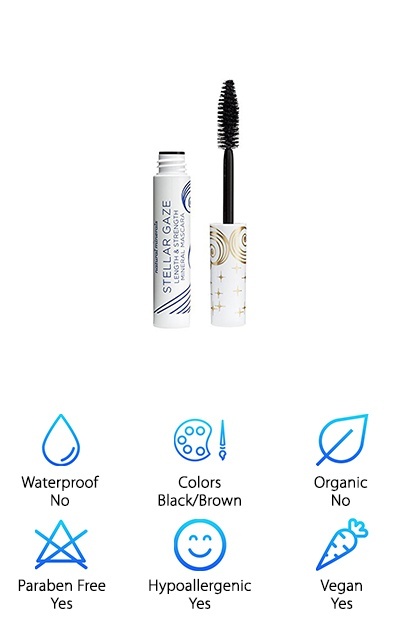 Our reviewers loved the background information on Ecco Bella All Natural Mascara. It is made from just six ingredients, including wax and purified water. You will love the way it glides on and enhances your look without overdoing things. Not only does Ecco Bella never test on animals, they also donate 10 percent of every purchase to the organization Friends of Animals. This is a vegan product, and any animal byproducts, lacquer, and shellac have been replaced by natural clays and flower waxes. It comes in both brown and black, so you can go for subtle, or va-va-voom. Clean beauty and superior performance are the claims Ecco Bello stands by. 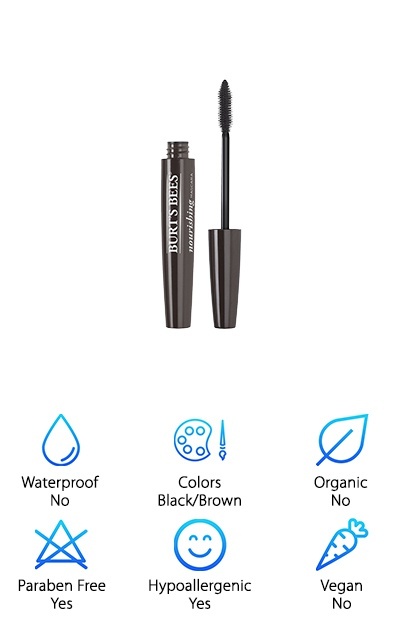 This mascara is also free of parabens, and it is hypoallergenic. It’s a winner!